To help users locate and manage content, AtoM includes powerful search support, available anywhere in the application through the search box located in the AtoM header bar, or through one of the many dedicated search boxes for specific entities or record types. AtoM uses Elasticsearch to power its search functionality - Elasticsearch is an open source distributed search server based on Apache Lucene, which acts as AtoM’s search and analytic engine. 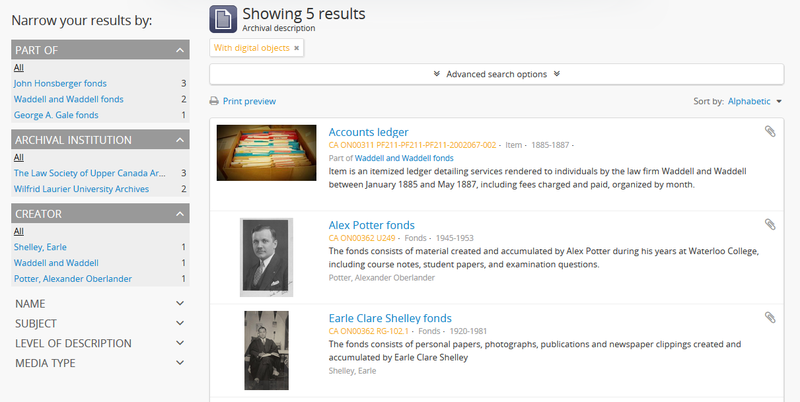 This section of the User Manual will cover the features available in the search box (including faceted typeahead results, institutional search box delimiters, and filter tags), and it will walk users through how to search for archival descriptions. Additionally, an outline of each of the dedicated search bars available throughout the application is provided, with instructions on how to search for different record types in each. For more information on how the search in AtoM is configured, see Advanced search - specifically, see: Advanced search using the AtoM Search box. The search box is the primary means to find descriptions in AtoM that contain text matching a search query. The search box is located in the header bar on all AtoM pages, including the home page. By default, when a user enters text and presses enter, the results returned are for archival descriptions. However, other record-type results can be discovered via the typeahead results presented in the search box (see: below). As a user types, typeahead search suggestions appear below the search box. The typeahead is set by default to begin providing suggestions only after at least three characters have been entered - for example, entering “a” or “an” in the search box will not prompt suggestions, but entering “ant” might produce suggestions such as an authority record for a person named “Anthony,” etc. The typeahead search results are intended as a navigational tool for quick searching of multiple entity types, but by default pressing enter after entering a query in the search bar will load a results page for archival descriptions. 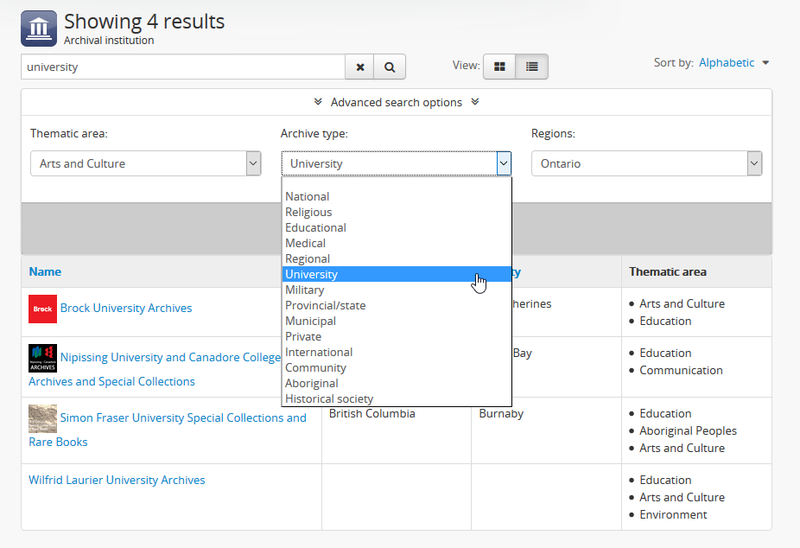 If you wish to search for an authority record or archival institution using the main search box, you must either click it when it appears in the drop-down, or alternately select it from a browse page when clicking the “all matching” option below each search facet in the typeahead. At this time, the main search box cannot be configured to return other record types when pressing enter. However, there are also dedicated search bars for authority records and archival institutions – see below. When viewing an archival description linked to an archival institution, or the institution record, the option to limit your search to the current institution appears as a radio button in a drop-down beneath the search box. To better support the use of AtoM as a multi-repository system, AtoM provides users with an institutional search box delimiter that can be toggled between a global search setting and a setting restricted to the holdings of a particular archival institution. When a user has viewed an archival institution record or an archival description related to an archival institution, clicking in the search box will reveal a set of radio buttons that allow the user limit the search results to the holdings of the most recently viewed archival institution, or to search globally (i.e., across all records in the application). Help text appears in the search box to indicate at a glance which setting is engaged: if the search box text says “Search”, the delimiter is set to perform a global search. If the help text says “Search [Name of Institution]” (where the name of the current related institution appears), this indicates that the delimiter is set to limit search box query results to the holdings of that institution. When a user views a linked archival description or an archival institution record, the search box delimiter will default to search within that institution. If you would like to perform a global search (i.e. across all records in the application), switch the radio button to Global search before proceeding. See below for further instructions on using the search box delimiters. When the delimiter is set to limit search results to a specific archival institution, typeahead search results for archival descriptions will also be limited to the holdings of that institution. However, other typehead results, such as authority record and archival institution suggestions, will not be limited (instead AtoM will continue to make suggestions from all records in the application for those types). If the Institutional scoping setting is turned on, then the the institutional search box delimiter is automatically turned off. Users can search the holdings of an institution via the dedicated search box provided in the institution block that will appear when the setting is engaged. For more information, see: Enable institutional scoping. If a delimited search is performed by accident (i.e. the user meant to perform a global search), the filter can be removed without having to perform the search again. Navigate to an archival description linked to an archival institution, or to an archival institution’s page. You can do this either by searching for the name of the institution or description, or by browsing. Place your cursor in the search box located in the AtoM header bar. A drop-down menu will appear beneath the search box with two radio buttons. By default, the radio button will be set to the related archival institution. If you would like to search within the holdings of that institution, you can begin typing your query. If you would like to search all records held in AtoM (i.e. globally), click the “Global search” radio button in the drop-down. Begin typing your query. If you see the result you are looking for appear in the typeahead, you can click it to go straight to the record - AtoM will redirect you to the selected description’s view page. When you have entered your search term(s), press enter to submit and begin your search. AtoM will redirect you to a search results page with descriptions that contain data that match your search query. 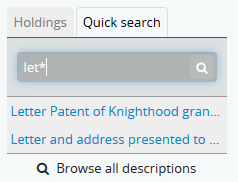 If you have used the institutional search box delimiter, a filter tag will appear at the top of your search results, indicating that these results have been limited to the current repository. If you wish to broaden the search results to all records in AtoM (i.e., if you did not intend to use the institutional search delimiter), you can click the “X” on the filter tag to remove it; AtoM will reload global search results. The search results page includes a number facet filters, to help you sort through the results and find the content you are looking for. For more information on working with facet filters, see: Facet filters. Search results can be sorted either alphabetically, by most-recently updated, by reference code, or by date of creation using the sort button available at the top-left side of the search results. For more information, see: Sort button. AtoM’s search and browse pages include a number of facet filters to enhance a user’s ability to quickly sift through results and find specific records. 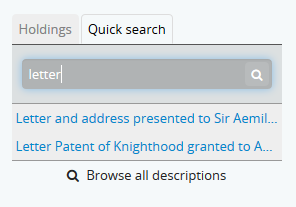 Searching for archival descriptions is accomplished using the search box located in the AtoM header bar, available anywhere in the application. 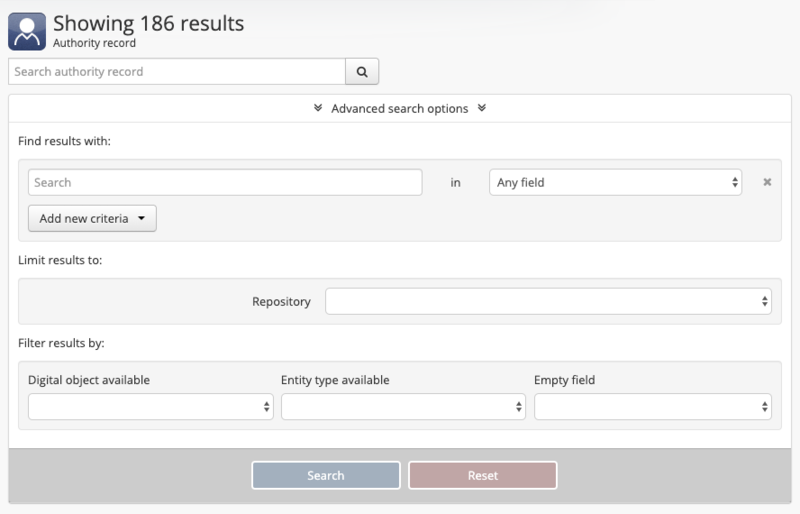 Though other kinds of record results can be found using the typeahead features of the general search box (see: Typeahead, above), when a user enters a search term and presses enter, by default the search box will return results for archival descriptions. The following will outline some of the steps involved in searching for archival descriptions. Only authenticated (i.e. logged in) users with access privileges to view drafts will be able to see draft descriptions in search and browse results. For more information on draft vs. published, and changing the publication status of an archival description, see: Publish an archival description. Trying to find a specific record inside a fonds, collection, or series? Check out the section below on our Treeview quick search. Place your cursor in the search box located in the header bar at the top of the page. A drop-down menu will appear. If you were viewing an archival institution, or an archival description linked to an archival institution when you placed your cursor in the search box, the search box delimiter will be set for the current related institution (otherwise, the only option will be “Global search”). If you wish to search only within the selected institution, leave the radio button set to search the current institution. If you wish to search all records in AtoM (i.e. globally, across institutions), click the “Global search” radio button. The examples in these instructions will illustrate how to perform a global search - see above for further instructions on using the search box delimiters to search within a single institution in a multi-repository system. When a user views a linked archival description or an archival institution record, the search box delimiter will default to search within that institution. If you would like to perform a global search (i.e. across all records in the application), switch the radio button to Global search before proceeding. See above for further instructions on using the search box delimiters. Begin to enter your search term. As you type, typeahead results will begin to appear in the search box dropdown. For more information on typeahead in search, see above - Typeahead and faceted search box results. The results that appear as you type will be faceted by entity - those with the description icon next to them are archival descriptions. If you see the record you are looking for in the faceted results provided by the typeahead, click the title in the search box drop-down to navigate to it. If you don’t, or would like to see more results, finish entering your search term and press enter. A: The number of relevant search results returned will be shown at the top of the screen, for context. Your search term(s) will be visible in the search bar - additionally, if you click to open the Advanced search panel, your search query will be visible in the first Boolean field at the top of the panel. For more information on the advanced search panel and using the options it contains, see: Advanced search. B: This is the Advanced search panel. Click to expand or collapse the panel. It contains a user interface for building Boolean search queries, as well as a number of additional filters that can be used to refine search results. For more information, see: Advanced search. Publication status - if a description’s publication status is “draft” (i.e. it is not visible to public users), the draft status will be indicated in the stub record. You must be logged in to see the draft status displayed. If no status is displayed, the record is published, and visible to public (i.e. not logged in) users. Level of description: Limits results to those that match the selected level of description (e.g. fonds, collection, series, file, item, etc.). Also includes a top-level description filter, that will limit to all parent records regardless of level of description. You can limit the digital object to a specific type of digital object (Image, Audio, Video, Text, or Other) using the Media Type facet filter available on the left-hand column of the search results page. For more information on Facet filters in AtoM, see: Facet filters. There is also a general digital object filter inclued in the Advanced search panel - see Advanced search. If you are searching within the holdings of a particular archival institution, consult the section above for guidance and tips on using the institutional search box delimiters: Using the Institutional search box delimiters. There is also a Repository filter in the advanced search panel that will allow you to limit the results to a specific institution - see Advanced search. When you have found the archival description you are looking for, click on its title, and AtoM will take you to the description’s view page. Note that you can use Boolean search operators such as AND, OR, or NOT, as well as Boolean special characters such as the * wildcard symbol to improve your search results, directly from the global search box in the AtoM header bar. For more information on available special characters and boolean searching in AtoM, see: Advanced search. If you still have not found the description you are searching for, you can try using the options in the Advanced search panel to further refine your results. For more information, see: Advanced search. In addition to AtoM’s general search, the treeview included in the context menu of an archival description view page also includes a “Quick search” tab, to help users quickly locate specific descriptions in a deep hierarchy. 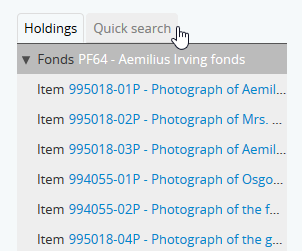 This is especially useful when using AtoM for archival arrangement and description over several sessions, to quickly return to a specific record when a fonds or collection includes many lower levels of description. 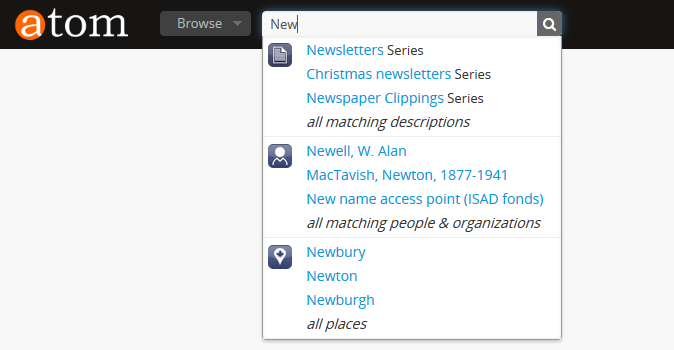 The treeview quick search can be accessed by navigating to an archival description, and clicking the “Quick search” tab above the treeview in the left-hand context menu of the description’s view page. Navigate to a top-level archival description (i.e. a fonds, collection, series, etc.) with many child records (lower levels of description). You can do so by searching or browsing - see Access content for more information on navigation in AtoM. Once you’ve arrived at an archival description, locate the treeview in the left-hand context menu of the description’s view page. Click the “Quick search” tab. The treeview will disappear, and a search box will be shown in its place (note: you can return to the treeview at any time by clicking the “Holdings” tab). Type a search term and press enter. AtoM will look for matches in the titles and identifiers (reference codes) of descriptions in the collection. Note that you can use Boolean search operators such as AND, OR, or NOT, as well as Boolean special characters such as the * wildcard symbol to improve your search results. For more information on available special characters and boolean searching in AtoM, see: Advanced search. Matching results will be returned as blue hyperlinks. Click a results title to navigate to the related description - AtoM will redirect you to a view page for the selected archival description. 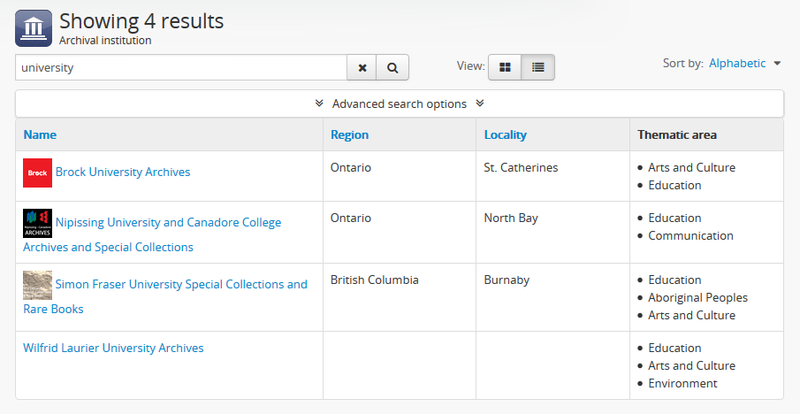 If you are unable to find a description you are searching for, you can also try using the Advanced search interface, which includes filters to be able to limit by archival institution and top-level description (e.g. by a particular fonds, collection, series, etc.). For more information, see: Advanced search. If you’d like to view all the descriptive levels in a hierarchy in a browse page, click the “Browse all descriptions” button at the bottom of the Quick search results. AtoM will redirect you to a browse page, where you can use features such as the browse page’s sort button and facet filters to navigate the descriptions. See: Using the Quick search bar’s browse option. In addition to the faceted results presented in the general search box (see above), AtoM also includes several dedicated search boxes for searching a specific entity or record type. In general these are included on the browse pages for the related entity. Basic instructions for each are included below. Some of these searches will return results from all (or most) data entry fields in the related records (i.e. full-text search), while others are currently only configured to return title matches. Details on each are included below. Dedicated search boxes that return more than just title matches currently include: authority records and archival institutions. These full-text search results have not been weighted to favor title matches, etc., except for accessions. If you see results without matches in the title (or name), it means the search term(s) appears somewhere in the body of the record. Note: with the release of 2.5, an advanced search screen is provided for authority records. For more information on working with authority records in AtoM, see: Authority records. For information on working with particular fields in the authority record edit template, see: International Standard Archival Authority Record for Corporate Bodies, Persons, and Families. Depending on the default label and menu settings in your installation, the authority records in your browse menu may appear under a different name (such as “People & Organizations” or another more user-friendly name). Administrators can change the default labels via Admin > Settings > User interface label, and the default menu labels can be changed via Admin > Menus. See the Administer section for more details. 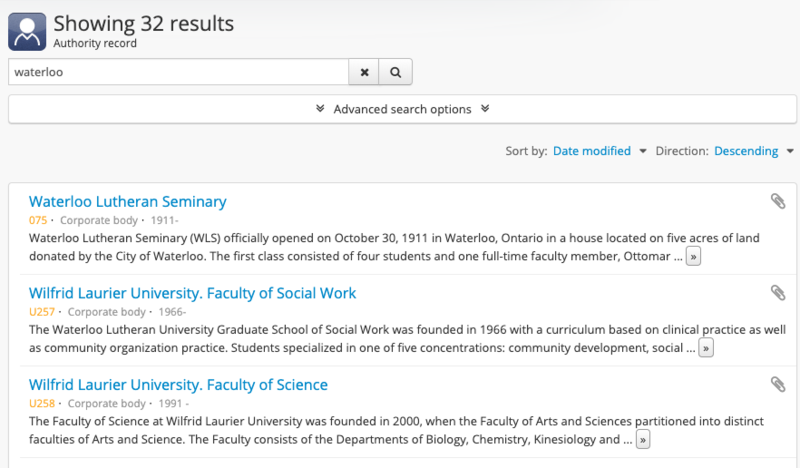 Place your cursor in the authority record search box at the top of the browse page. Type a search term and press enter, or use your mouse to click the search button (represented by the magnifying glass icon to the right of the search box). AtoM will reload the page with results. If there are more than 10 results, a pager will be included at the bottom of the results page. Note that if an image has been uploaded for an authority record, the thumbnail will appear in the search results, as will the first few lines of the history. See above for a list of fields that AtoM will search in an authority record. Results have not been weighted to favor title matches. If you see results without matches in the title (i.e. the authorized form of name), it means the search term(s) appears somewhere in the body of the record. The results page includes a sort button (allowing you to sort results to show them in alphabetic order, or most recently created/updated) and a set of facet filters to help you sift through results. For more information on these elements, see Sort button and Facet filters. You can use Boolean search operators such as AND, OR, or NOT, as well as Boolean special characters such as the * wildcard symbol to improve your search results. For more information on available special characters and boolean searching in AtoM, see: Advanced search. You can click the button next to your search term in the dedicated search box to clear the field and begin a new search. Alternately, simply place the cursor in the search box and enter a new search term. When you have found the record you are searching for, click on its title in the results, and AtoM will redirect you to the selected authority record’s view page. Below is a list of all indexed authority record field names as they are found in Elasticsearch, the search index used in AtoM. Expert users can use the infomation below to target search queries to specific indexed fields, and implement search parameters otherwise not directly available via the user interface. For more introductory information on syntax and basic use, see the Advanced search documentation - specifically, Introduction and basic usage. These must be used in the relevant dedicated search box to return results. Not all fields have been tested for their ability to be searched. In some cases, the parameter expected may be an internal ID value and not a string - for example, when searching for controlled terms that appear in a drop-down menu in the AtoM edit pages. For more information on working with accession records in AtoM, see: Accessions. See also: Deaccession records. In order to search by accession number, please use the prefix “identifier:” before the accession date (i.e. identifier:2015-12-28). This will pull up all accessions that begin with the accession date 2015-12-28. Do not use the rest of the accession number, as the backslash will break the search. This issue has been marked for resolution in the 2.3 release of AtoM. To view and search for accession records in AtoM you must be logged in to a user account with sufficient access privileges, such as an editor or an administrator. For more information on user roles, see: User roles. For information on default permissions for user roles, see: Default permissions by user role. For information on changing edit permissions, see: Edit permissions. See also: Manage user accounts and user groups. 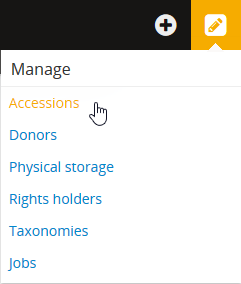 Navigate to the accession record browse page by clicking on the Manage menu (located in the main menu for logged-in users, in the top-right of the AtoM header bar) and choosing “Accessions” - i.e., Manage > Accessions. AtoM will redirect you to the accessions browse page. A list of your accessions will appear; if there are more than 10 results, a pager will be included. 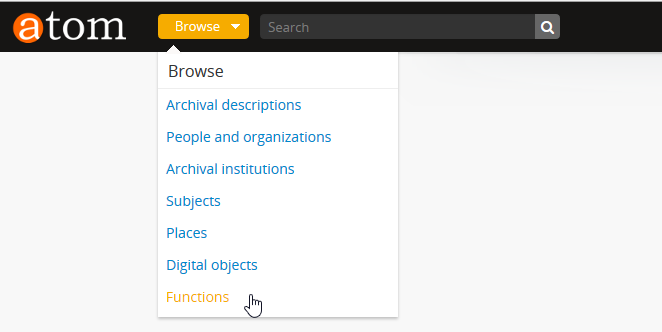 To begin searching for an accession, place your cursor in the the dedicated search box at the top of the Accessions browse page. An administrator can change the number of results per page for browse and search result pages throughout AtoM via Admin > Settings > Global > Results per page. By default, the number is set to 10. For more information, see Settings. Type a search term into the dedicated search box and press enter, or use your mouse to click the search button (represented by the magnifying glass icon to the right of the search box). AtoM will reload the page with results. If there are more than 10 results, a pager will be included at the bottom of the results page. The results page also includes a sort button (allowing you to sort results to show them in alphabetic order, or most recently created/updated). For more information, see Sort button. When you have found the record you are searching for, click on its title in the results, and AtoM will redirect you to the selected accession record’s view page. Below is a list of all indexed accession record field names as they are found in Elasticsearch, the search index used in AtoM. Expert users can use the infomation below to target search queries to specific indexed fields, and implement search parameters otherwise not directly available via the user interface. For more introductory information on syntax and basic use, see the Advanced search documentation - specifically, Introduction and basic usage. These must be used in the relevant dedicated search box to return results. A dedicated search box for archival institutions has been provided on the archival institution browse page. All fields are indexed, but no weighting has been added to specific fields. For more information on navigating the archival institution browse page, see: Browse archival institutions. For more information on working with archival institution records in AtoM, see: Archival Institutions. For information on working with particular fields in the archival institution record edit template, see: International Standard for Describing Institutions with Archival Holdings. Depending on the default label and menu settings in your installation, the archival institution label in your browse menu may appear under a different name (such as “Repositories,” “Archives,” or another more user-friendly name). Administrators can change the default labels via Admin > Settings > User interface label, and the default menu labels can be changed via Admin > Menus. See the Administer section for more details. 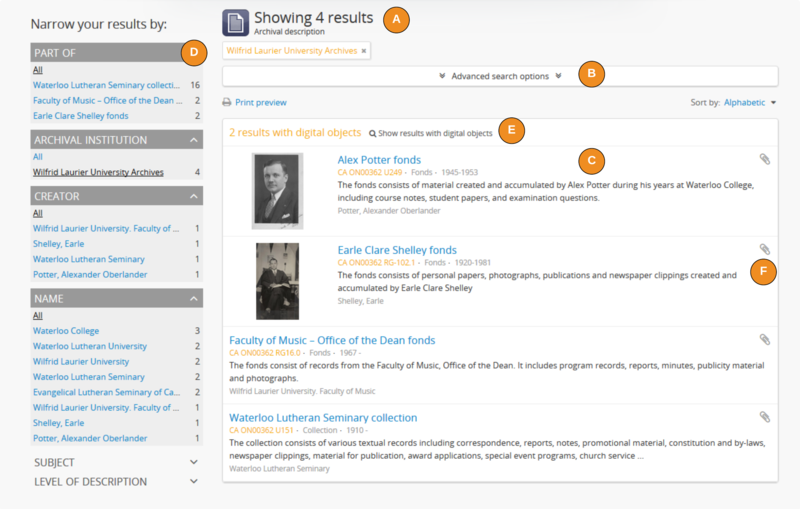 Place your cursor in the dedicated search box at the top of the archival institution browse page. Type a search term and press enter, or use your mouse to click the search button (represented by the magnifying glass icon to the right of the search box). You can use Boolean search operators such as AND, OR, or NOT, as well as Boolean special characters such as “quotations” or the * wildcard symbol to improve your search results. For more information on available special characters and boolean searching in AtoM, see: Advanced search. AtoM will reload the page with results. If there are more than 10 results, a pager will be included at the bottom of the results page. In the current release, results have not been weighted to favor title matches. If you see results without matches in the title (i.e. the authorized form of name), it means the search term(s) appears somewhere in the body of the record. AtoM will reload the page, with the results refined based on the Advanced search filters. After a search, the advanced search filters will reset. You will have to re-apply them to perform the same search again. Results in the table view can be sorted based on column - click on the column header to sort the results; click again to reverse the sort order. The results page also includes a sort button (allowing you to sort results to show them in alphabetic order, by identifier, or by most recently created/updated), and a set of facet filters to help you sift through results. For more information on these elements, see Sort button and Facet filters. When you have found the record you are searching for, click on its title in the results, and AtoM will redirect you to the selected archival institution’s view page. Below is a list of all indexed repository field names as they are found in Elasticsearch, the search index used in AtoM. Expert users can use the infomation below to target search queries to specific indexed fields, and implement search parameters otherwise not directly available via the user interface. For more introductory information on syntax and basic use, see the Advanced search documentation - specifically, Introduction and basic usage. These must be used in the relevant dedicated search box to return results. As of AtoM 2.1, a dedicated search box for terms has been provided on the browse page for each taxonomy. In AtoM 2.1, the public interface for browsing places and subjects was redesigned to make useful elements of the taxonomy and term management pages available to unauthenticated (i.e. public) users - for more information, see: Terms. In the following example, the Place taxonomy has been used to demonstrate the search functionality, because it is one of the modules (along with Subjects) where the search box is available to both authenticated and public users. However, the same search box has been included on all taxonomy pages (available to authenticated users with the proper permissions via Manage > Taxonomies, and then selecting a taxonomy). A place is a geographic location registered in a taxonomy and used as an access point in archival descriptions. For more information on managing places in AtoM, see: Terms. For information on adding access points to an archival description, see: Add an access point “on the fly” from an archival description. First, navigate to the relevant taxonomy. For Places and Subjects, use the browse menu (available as a drop-down menu next to the search box in the AtoM header bar at the top of the page), navigate to Browse > Places or Browse > Subjects. For all other taxonomies (available only to authenticated (i.e. 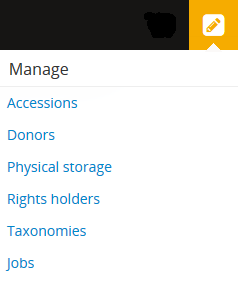 logged in) users with the proper access privleges), open the Manage menu located in the AtoM header bar, select “Taxonomies”, and then choose the taxonomy you would like to search. AtoM will redirect you to the related terms browse page. A list of your terms will appear; if there are more than 10 results, a pager will be included. If desired, you can search either only for the preferred label (e.g. the formal name of the term entered into the “Name” field on the term edit page), or for only the “Use for” (e.g. alternate, non-preferred names) labels associated with the term, using the drop-down menu located on the left of the dedicated search box. By default, AtoM will search All labels (e.g. both the preferred and ‘Use for’ labels) associated with a term. At the moment, only the labels associated with a term (e.g. its name, and any “Use for” names added) are searchable. Content in other fields (e.g. scope note, source note, etc) will not return results. Place your cursor in the dedicated search box at the top of the browse page. Type a search term and press enter, or use your mouse to click the search button (represented by the magnifying glass icon to the right of the search box). When you have found the record you are searching for, click on its title in the results, and AtoM will redirect you to the selected term’s view page. Below is a list of all indexed term field names as they are found in Elasticsearch, the search index used in AtoM. Expert users can use the infomation below to target search queries to specific indexed fields, and implement search parameters otherwise not directly available via the user interface. For more introductory information on syntax and basic use, see the Advanced search documentation - specifically, Introduction and basic usage. These must be used in the relevant dedicated search box to return results. 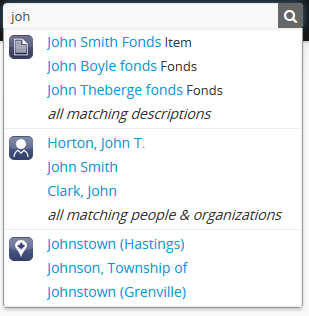 A dedicated search box for donor records has been provided on the Donors browse page. In AtoM 2.0, this search box will only return title (i.e. Authorized form of name) matches However, the search box is configured to return partial matches, so for example, a search for “ju” would return names such as Jules, Julie, June, Jude, etc. This allows the dedicated search box to be used as a navigational aid, allowing a user to quickly locate a specific record when there are many donor records saved in the system. For more information on working with donor records in AtoM, see: Donor records. To view and search for Donor records in AtoM you must be logged in to a user account with sufficient access privileges, such as an editor or an administrator. For more information on user roles, see: User roles. For information on default permissions for user roles, see: Default permissions by user role. For information on changing edit permissions, see: Edit permissions. See also: Manage user accounts and user groups. 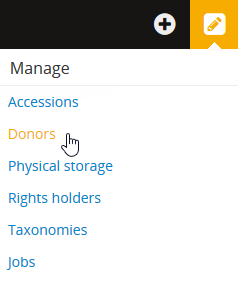 Navigate to the donor record browse page by clicking on the Manage menu (located in the main menu for logged-in users, in the top-right of the AtoM header bar) and choosing “Donors” - i.e., Manage > Donors. AtoM will redirect you to the Donors browse page. A list of your donor records will appear; if there are more than 10 results, a pager will be included. To begin searching for a donor record, place your cursor in the the dedicated search box at the top of the Donors browse page. In 2.0.0, AtoM will only search on the title (i.e. authorized form of name) of the donor record, but it will provide fuzzy matching - that is, instead of requiring an exact match on a title, it will return partial matches as well - so a search for “way” would return donor names such as Wayson, Wayne, and even Galloway, instead of failing to return any (as in an exact match search). When you have found the record you are searching for, click on its title in the results, and AtoM will redirect you to the selected donor record’s view page. A dedicated search box for Rights holder records has been provided on the Rights holders browse page. In AtoM 2.0.0, this search box will only return title (i.e. Authorized form of name) matches However, the search box is configured to return partial matches, so for example, a search for “un” would return terms such as Underwood, United, and University, as well as Munn. This allows the dedicated search box to be used as a navigational aid, allowing a user to quickly locate a specific record when there are many rights holder records saved in the system. For more information on working with Rights and Rights holder records in AtoM, see: Rights. To view and search for Rights holder records in AtoM you must be logged in to a user account with sufficient access privileges, such as an editor or an administrator. For more information on user roles, see: User roles. For information on default permissions for user roles, see: Default permissions by user role. For information on changing edit permissions, see: Edit permissions. See also: Manage user accounts and user groups. 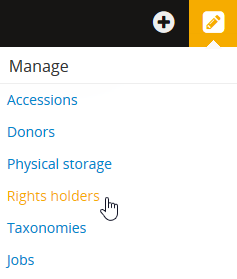 Navigate to the rights holder record browse page by clicking on the Manage menu (located in the main menu for logged-in users, in the top-right of the AtoM header bar) and choosing “Rights holders” - i.e., Manage > Rights holders. AtoM will redirect you to the Rights holders browse page. A list of your rights holder records will appear; if there are more than 10 results, a pager will be included. To begin searching for a rights holder record, place your cursor in the the dedicated search box at the top of the Rights holder browse page. In 2.0.0, AtoM will only search on the title (i.e. authorized form of name) of the rights holder record, but it will provide fuzzy matching - that is, instead of requiring an exact match on a title, it will return partial matches as well - so a search for “way” would return donor names such as Wayson, Wayne, and even Galloway, instead of failing to return any (as in an exact match search). When you have found the record you are searching for, click on its title in the results, and AtoM will redirect you to the selected rights holder record’s view page. A dedicated search box for functions has been provided on the functions browse page. In AtoM 2.0.0, this search box will only return title (i.e. authorized form of name) matches However, the search box is configured to return partial matches, so for example, a search for “sing” would return terms such as Singing, Singe, and Singular, as well as Licensing, Browsing, etc. This allows the dedicated search box to be used as a navigational aid, allowing a user to quickly locate a specific record when there are many function records saved in the system. For more information on working with functions in AtoM, see: Functions. For information on working with particular fields in the functions edit template, see: International Standard for Describing Functions (ISDF). Navigate to the functions browse page by clicking on the browse menu (located in the AtoM header bar, next to the general search box) and selecting “Functions” from the drop-down menu that appears. AtoM will redirect you to the functions browse page. A list of your functions will appear; if there are more than 10 results, a pager will be included. To begin searching for an accession, place your cursor in the the dedicated search box at the top of the Accessions browse page. In 2.0.0, AtoM will only search on the title (i.e. authorized form of name) of the function, but it will return partial matches - so a search for “reg” would return Regular, Registration, and Regulation, as well as Deregulation and Desegregation. When you have found the record you are searching for, click on its title in the results, and AtoM will redirect you to the selected function’s view page. A dedicated search box for managing Users and user accounts has been added to the user browse page. This search box will only return user name and email matches However, the search box is configured to return partial matches, so for example, a search for “ca” would return Names such as Cameron, Cal, and also Bianca, as well as returning any user with an email that ends with “.ca”. This allows the dedicated search box to be used as a navigational aid, allowing an administrator to quickly locate a specific user when there are many user accounts saved in the system (particularly in a multi-repository system such as a network or portal site). For more information on working with User accounts in AtoM, see: Manage user accounts and user groups. See also: Edit permissions. 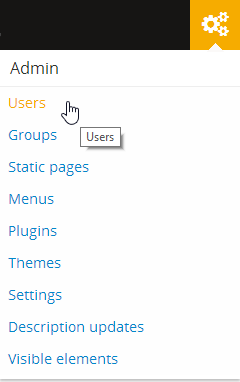 Navigate to the Users browse page by clicking on the Admin menu (located in the main menu for logged-in administrators, in the top-right of the AtoM header bar) and choosing “Users” - i.e., Admin > Users. AtoM will redirect you to the Users browse page. A list of the user accounts in your AtoM installation will appear; if there are more than 10 results, a pager will be included. To begin searching for a specific user, place your cursor in the the dedicated search box at the top of the page. Type a search term (such as a name or email) into the dedicated search box and press enter, or use your mouse to click the search button (represented by the magnifying glass icon to the right of the search box). Users marked “Inactive” will not be included in search results. To locate an inactive user, you will have to browse through the list of users who have been marked inactive. Use the blue tabs (sometimes called “pills” due to their rounded shape) to switch from “Show active only” to “Show inactive only”. 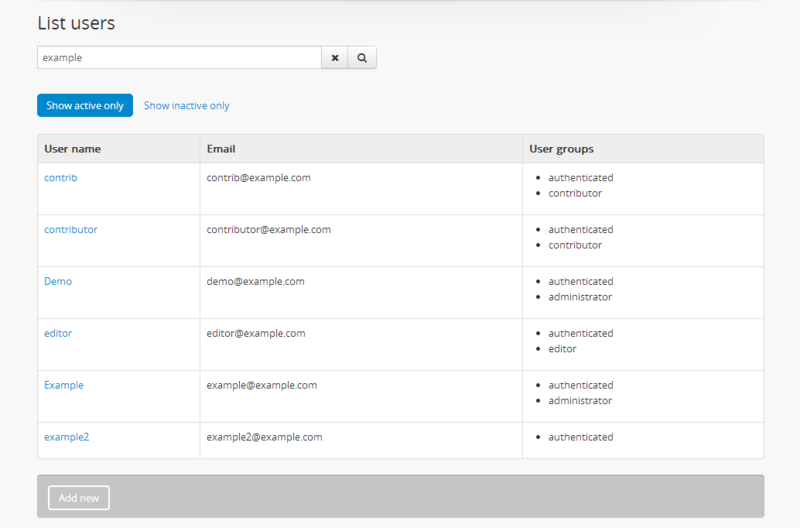 For more information on users, see Manage user accounts and user groups. For specific information on marking a user inactive, see: Mark a user “Inactive”. In 2.0.1, AtoM will only search on the title (i.e. authorized form of name) of the rights holder record, but it will return partial matches - for example, a search for “way” would return donor names such as Wayson, Wayne, and even Galloway, instead of failing to return any (as in an exact match search). Similarly, a search for “es” would return names such as Esther and Reeves, as well as any email address ending in “.es”. When you have found the user record you are searching for, click on its title (i.e. user name) in the results, and AtoM will redirect you to the selected user’s profile. As of AtoM 2.1, a basic search of physical storage containers has been added to the physical storage module’s browse page. Note that special characters for Boolean search (e.g. the * wildcard or ~ fuzzy search characters) are not supported in this search box. However, the search box is configured to return partial matches, so for example, a search for “Box 1” would return container names such as Box 10, Box 11, and Box 100, etc. This allows the dedicated search box to be used as a navigational aid, allowing an administrator to quickly locate a specific container when there are many containers saved in the system. For more information on working with the Physical storage module in AtoM, see: Physical storage. Navigate to the Physical storage browse page by clicking on the Manage menu (located in the main menu for logged-in administrators, in the top-right of the AtoM header bar) and choosing “Physical storage” - i.e., Manage > Physical storage. AtoM will redirect you to the Physical storage browse page. A list of the containers you have created in your AtoM installation will appear; if there are more than 10 results, a pager will be included. To begin searching for a specific container, place your cursor in the the dedicated search box at the top of the page. Type a search term (i.e. a whole or partial container name) into the dedicated search box and press enter, or use your mouse to click the search button (represented by the magnifying glass icon to the right of the search box). When you have found the user record you are searching for, click on its title (i.e. user name) in the results, and AtoM will redirect you to the selected container’s view page.